Learn how to create your own custom public and private policies and how to associate each policy with different components of a service's definition such as organizations, services, operations, bindings, and access points. The Policy Manager Scripting API, located in the \docs\scriptDocs folder of the Policy Manager installation folder, provides a series of interfaces and classes you can use to build process-related scripts. The API includes lots of use cases and sample code you can experiment with and use as a baseline when building your own custom operational policy scripts. 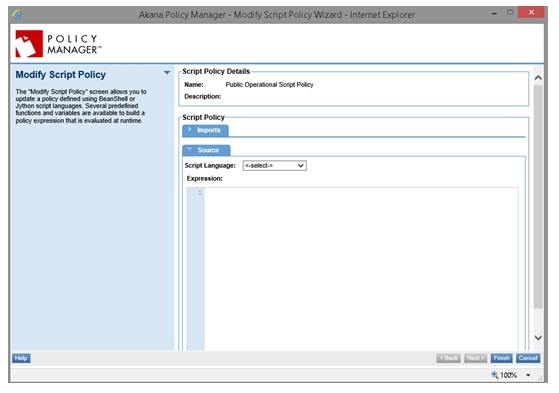 You can also access the Scripting API on the Akana docs site: Policy Manager Scripting API. This policy is considered Private and is not available to the Network Director when attached to a physical service. 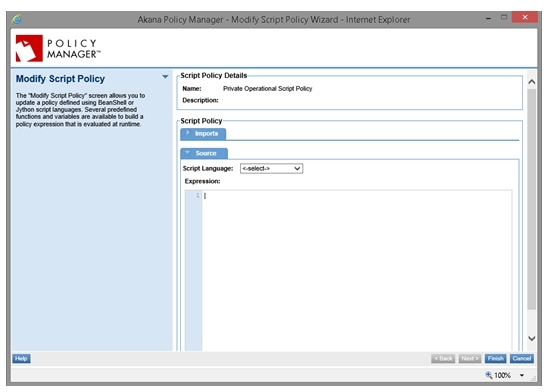 To support executing an Operational Script Policy as a Consumer when calling a physical service, Policy Manager 8.x and later includes the Public Operational Script Policy. Imports: This section includes common functions that you might need to perform in your scripts that have been saved in Script objects, using the Policy Manager > Workbench > Organization > Scripts > Add Script function. The available scripts are listed in the Available Scripts tree. You can move any number of the scripts in that tree to the Imported Scripts list box. Only scripts that match the language type are available for selection in the tree. Expression: A text box that allows you to enter your script. Let's take a quick walkthrough of the configuration process for each policy to get you started. 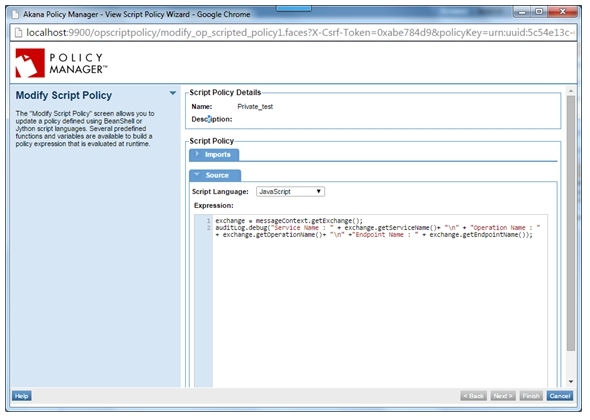 In Policy Manager, to create a Private Operational Script Policy instance, go to Policies > Operational Policies and choose Add Policy. To illustrate how to use the policy, we are going to add script code that gets the Service Details. In the Function drop-down, as shown below, you can specify a function. Create your own policy handlers and either use one of the functions listed or create a new function and add it into the list. 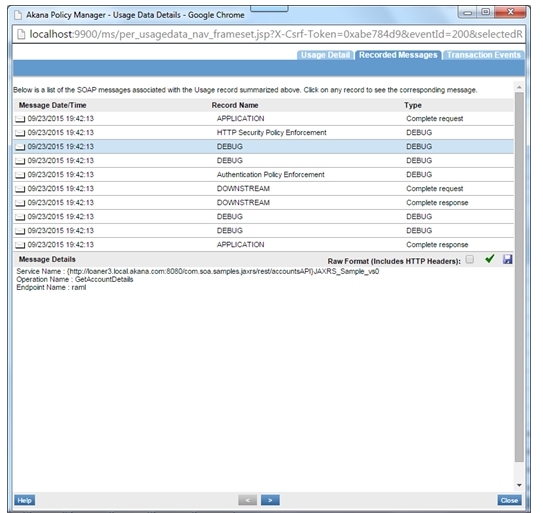 Manage the order in which policies are executed. This allows more predictable ordering of the sequence in which different policies are executed or implemented. 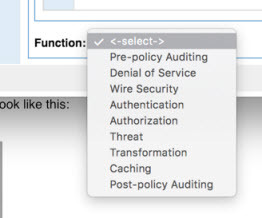 For example, Wire-Security policies are enforced before Transformation policies. Pre-policy Auditing: Performs the function of auditing, or message logging, before any other policies can affect the message. Denial of Service: Addresses any potential denial of service attacks. Wire Security: Enforces security on the message, ensuring that the message was delivered securely; for example, verifying that a message was signed or encrypted. Authentication: Authenticates any credentials sent in the message. Authorization: Authorizes the authenticated user. Threat: Addresses any message threats such as script injection, SQL injection, or viruses. Transformation: Changes the content of the message. Caching: Returns cached responses if possible. Post-policy Auditing: Performs the function of auditing, or message logging, after all policies have been enforced. After you've saved your policy, activate it, and attach it to a web service operation. 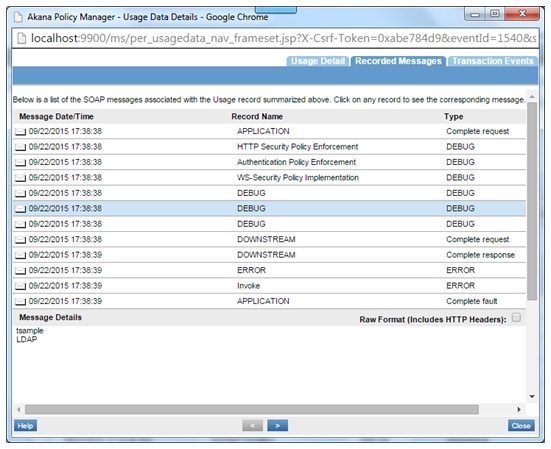 To test the policy, send a request and select Monitoring > Logs > View Usage Record Details > Recorded Messages to view the DEBUG statement that prints the service details. 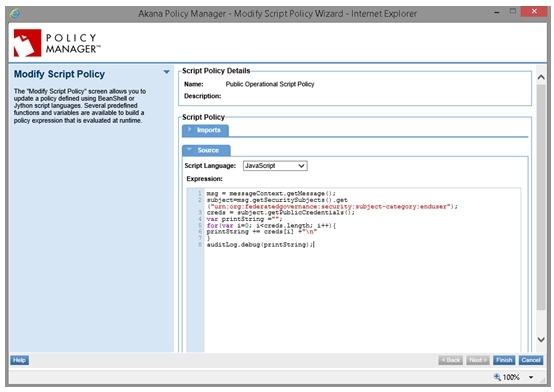 In Policy Manager, to create a Public Operational Script Policy instance, go to Policies > Operational Policies and choose Add Policy. To illustrate how to use the policy, we are going to add script code that will get public credentials. To test the policy, send a request and select Monitoring > Logs > View Usage Record Details > Recorded Messages to view the DEBUG statement that includes the public credentials. For a sample scenario showing how to provide custom content for fault messages using an Operational Script, policy, see How to Replace Fault Messages.